Welcome to our piece of paradise. Set in native bush and surrounded by landscaped gardens, this spacious, architecturally designed house has expansive views over the Tryhpena Harbour to Coromandel and beyond. Set on a 4ha property, and located well off the road this well-appointed house can offer you privacy and relaxation. With three large double sized bedrooms, one with en-suite, bathroom and separate shower room, expansive open plan living and kitchen areas flowing out to substantial decks this eco-friendly house can offer you a holiday to remember. There is an extensive library, selection of games and a fascinating collection of artefacts collected from around the world. While here you are welcome to explore the organic garden where everything from vegetables, peaches, nectarines can be gathered depending on the season. A 4 wheel drive vehicle is recommended as the driveway is relatively steep as the house is on a ridge overlooking the harbour. A short drive to safe swimming beaches, cafes, shops, tennis court and bars. 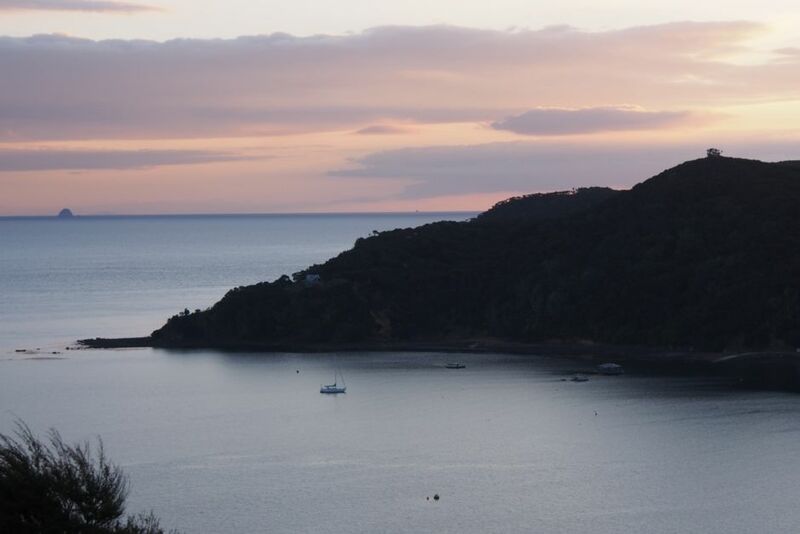 Explore the delights of Great Barrier Island, with it's stunning walks, white sand beaches, natural hot pools, whales and dolphins, fishing etc etc or just relax in the houswith it's smart TV, extensive book and DVD libraries, stunning scenery. Watch the stars from your own bed. The house is set in the most perfect location with spectacular views from every window. The sunsets and dawns every day were stunning. Living in the house is easy and the decor and books were truly appreciated. Loved the tui song, the kaka visits, the fresh vegetables and eggs! I would hire a 4WD next time for the driveway. Loved the The Lookout! So tastefully decorated in a very spacious home with an outlook to die for. Really enjoyed ourselves and despite some bad weather, we were able to enjoy ourselves indoors. Would love to return. Thank you Dheepa for your kind words I was so concerned when I heard about the weather. Hope you were able to cook your Christmas dinner satisfactorily. We had a wonderful week here - it was a gorgeous place for writing: comfortable, peaceful, well-equipped and a short (if steep!) walk to Tryphena and the beach. Superb. Start unwinding as soon as you make your way up the native bush lined driveway. Start unwinding as soon as you make your way up the native bush lined driveway. The Lookout is the ultimate relaxation retreat. We had the most idyllic and magical week, which we will treasure for years to come. The house has everything you need and the views are breathtaking. Lovely bach. Well equipped with stunning views. 4WD needed for the driveway. The property was very nicely presented and furnished. The property was very nicely presented and furnished. A 'home-away from home'. The garden with fresh herbs and vegetables was a nice. I admit we harvested some lettuce leaves and a nearly over mature fennel bulb; it made a beautiful fresh salad. The previous tenets were correct ion pointing out that the driveway is step and long and tested our aged team to limit. Call us lazy but we rented a 4x4 for the duration.